Barefoot Angie Bee: 42 on 101010. Big Ol' Fat Giveaway! 42 on 101010. Big Ol' Fat Giveaway! "The date is 10.10.10. Besides the symmetry of the number, which is beautiful in and of itself, is the ultra nerdy stuff people like myself love. you see, 101010 is not only redundant it is also binary for the number 42. If it were 26 maybe you, my American readers would be more intrigued. But for those who see distances in kilometers, 42 means a great deal. Like the number of kilometers in a marathon. So there is no way I am going to miss running a marathon on 10.10.10." According to Dane Rauschenberg's blog post Sunday may bring us closer to the answer to Life The Universe and Everything. My hubby thinks this is silly but I love it! 42. The meaning of Life, The Universe, and Everything. T Being a Douglas Adams fan and a little bit of a geek, I wish that I could run a marathon in his honor or just to celebrate the day in some way. I am only going to be running 10 miles but I will be thinking of all the marathoners heading out there tomorrow. 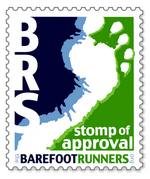 It is also the date of the NYC Barefoot Run! I hope to be there next year for sure. Lets celebrate all of it with a big ol' fat giveaway! If I don't just put this out there I will procrastinate until I am so loaded down with crap to do that I just throw my hands in the air and say eff it all. So instead of one giveaway for each and ridiculous amount of pressure on me, I am doing one really big one with a huge amount of ways to increase your chances of winning depending on how much time you want to put into gaining entries! Besides, these are all some of my favorite things, (insert Julie Andrews singing here) and I want to share about the stuff I am diggin' on now. 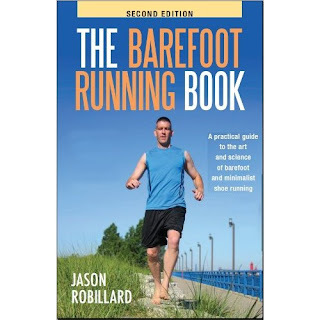 I have a signed copy of Jason Robillards book "The Barefoot Running Book". Second edition! This is good stuff people! He is funny and full of down to earth (hehe) useful barefoot knowledge. 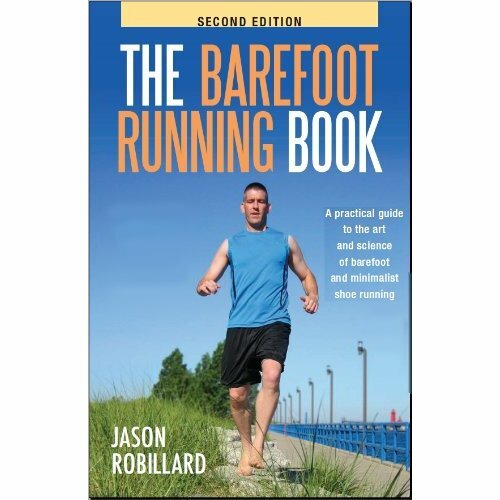 I often, even having run for over a year barefoot, refer to his book for info. Dean over at Clif Bar is letting me give away a box of mixed flavors of gels. They have revamped the ingredients and the look. I can say they are pretty great! mmmm chocolate cherry! They will be able to send out the Clif at the beginning of November since they have not been on the market yet. A nuun care package with three flavors and a nuun water bottle. You must stay hydrated and nuun is the prime way to do so! For those marathoners out there (and aspiring marathoners of course), I have a medal hangar from Allied Steel that they gave me to pass on to one of you. They sent me a Barefoot Angie Bee hanger that totally rocks! Boys and Girls both sign up and get the word out! I will announce a winner on Monday October 18th. Become a follower of this blog or let me know if you are already are a koolaide drinker. Like Clif Bar on facebook. Spread the word on your blog, facebook, twitter, email, ect. How do you display your race bling? Lots of wonderful things going on for me. My running is fun as ever. I have made some new friends and am loving the upcoming opportunities and I have a wonderful family that keep me grounded and safe through all of my adventures. I have added him to my blog list, not sure how to follow him. I also now like nuun on fb. I am surprised that I was not a fan of any of those pages on FB. I now fuel with sharkies organic gummies. I used to and will continue to fuel with banana nuun tablets. I like to drink water and gatorade when available. Sorry should have noticed this was the next entry- I used to and will continue to fuel with banana nuun tablets. I like to drink water and gatorade when available. I don't, I have them in an envelope in a cabinet. If I win I look forward to having a designated display of my hard work. I have tried barefoot running once. I went out and did way too many miles for a first barefoot run and my feet were torn up for a week. I am considering becoming a barefoot runner after my marathon tomorrow. I couldn't make the switch during this training cycle but look forward to the change. I think my feet will thank me in the long run. Shoes disagree with my feet. Don't have any bling yet, but instead of finished metals, The Pink Series half marathon is giving away necklaces. Looking forward to wearing it proudly! I use nuun to hydrate. I have a shelf with hooks on it that my bling gets hung on and I have my marathon medals hanging next to the posters from those marathons. Yes, I am a faithful follower:) You always have awesome giveaways! I hope that you have a wondeful running week Angie Bee:) Take care! I just tried nuun on my long run today, and it worked really well. I'd like to try barefoot running, but haven't yet. I have done some strides on golf courses, but nothing too long. Like Nuun, incidentally I tried Nuun for the first time yesterday at Power-tri, local tri store at a Kona party. It was awesome! I'll be getting some for sure. I like to fuel prerun with RokitFuel and then during the run with clif, sports beans or shot bloks. Occasionally with shot roks too. I usually just use water to hydrate, but after trying nuun yesterday, I'm def going to add it to my arsonnal. The only race bling I have so far, isn't a medal. It's a dogtag style necklace with the race symbol laser cut into it. Much cooler looking than it sounds. So, I sometimes wear them (done the race twice) as a necklace. I have only barefoot run on accident, chasing kids or the mailman. Have a cousin who does it and loves it though. I am already a koolaid drinker! I like Clif bar on FB! I like Allied Steel on FB! During the run - Chocolate GU and water. After clif bars, chobani and water. I live on water and coffee. I almost always have some form of hydration with me! My marathon medals are in a case, but the rest of my bling is hidden in a bag in a drawer. so sad! I have tried it. And it is not my friend. I supinate and have an extra bone on the outside of my foot that is the direct contact point when my foot hits the ground. Extremely painful. I usually fuel by eating a slight breakfast (usually a flatbread with peanut butter, banana and raisins on top). Sometimes I eat some dry cereal, though- and lots of water. I display all my race numbers/bibs at work- they're lining one of the walls of my cubicle, haha. I haven't won anything like a medal but I guess if I did, I'd probably put that up there too :). Can't say that I've ever tried barefoot running. I think my feet would get cold, honestly. Hydrate: Usually G2 and sometimes Nuun. Bling: Hanging on a bulletin board in my office right now. Barfoot Running: I haven't tried but have been going for more minimal shoes. I like allied steel on fb. I love Clif shot bloks. Right now I pretty much just hydrate with water, I haven't had the opportunity to try much else! our race medals are currently in a drawer amongst my scrapbooking stuff. I am working on doing a project with most of them, but there are those that are too big too work with! I have never tried barefoot running, at least not since I was a kid. I think I am far too wussy for it! I have my race bibs and other stuffs in a beautiful box on my dresser. It's a perfect reminder of why I'm bothering to put on my running clothes. I've never run barefoot, but I want to SO SO bad. I'm just scared of the cold/sharp/road. There is an elementary school with a track around a chunk of grass that I really want to try soon. I fuel myself with whole foods. Fruits and veggies and lots of water. Okay and a cup of coffee each morning to kickstart. I've tried barefoot running. I often run in the field behind our house. I don't have any race bling yet, but hope to change all that soon! So far I just got a t-shirt for the 5K I ran last week. I love the steel bling hangers. So cool that they made you a custom one! I follow you miss thang! I eat a half a granola bar or something similar before a run. Thats it. Never tried fueling during....I know, Im weird. I drink the day before a bunch and the night before but I rarely drink during. When I come back its coffee and water. Again, I know I am weird. Open for advice though. I just feel fine so I done want to change the mojo. I have never tried barefoot running unless you include chasing my boys around the house. Interested, intrigued bit not sure I could hack it. 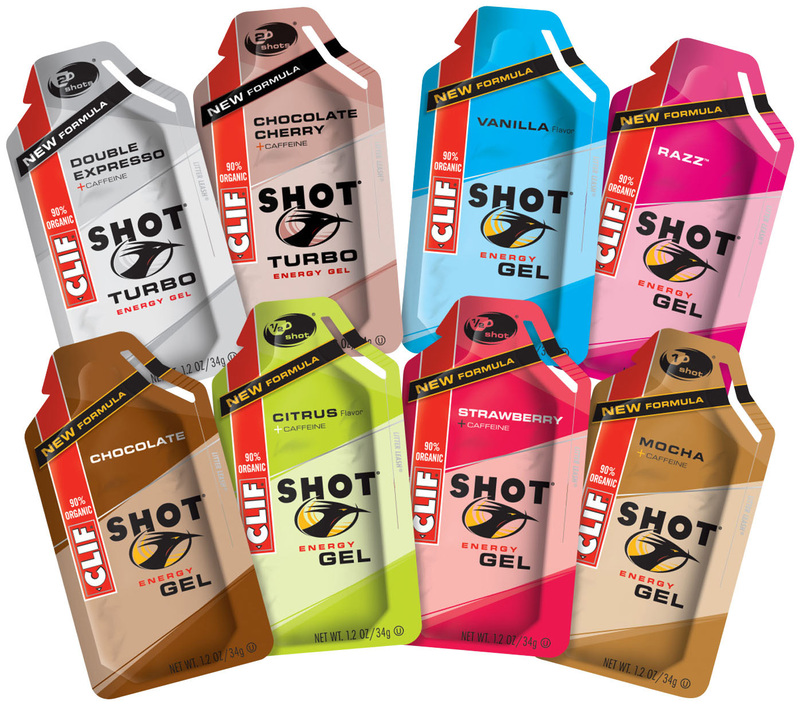 I like Clif on facebook - and I'm wondering if the new packages are easier to tear open? I like nuun on facebook. I've linked to your giveaway on my blog. I fuel with gels (prefer GU, Accel, Powerade in that order), and just recently tried Clif Shot Bloks during a half marathon and I loved them. Will be working those into my fueling routine more. I hydrate with water and Gatorade because my coaches place it on the course. I hate carrying a bottle so I haven't tired nuun yet, but I'm planning on getting a fuel belt for my marathon training and want to give it a try. My medals are hanging off the corner of my wardrobe mirror. I tried barefoot running once after a few beers. I've done some barefoot running. shoeless either on TM or in my yard and some on the road in my 5F. I have some hooks for my bling. :) This is a new addition. They used to be in the closet. I'm running out of space. I'm a minimalist hydrater.. usually just water. Though I've used some Nuun. I'd be interested in giving it another chance. fuel. I like bananas preworkout, and gels during.. or blox. Gels first then blox. I like Clif Bar on facebook! I like Allied Steel on facebook! I follow @ClifBar on twitter! I fuel with bananas + peanut butter (Yummmm)! I hydrate with water. i hate the taste of anything that ends with “-ade“. i havent found Nuun in Mexico. I dont have much of a collection to display, but thats going to change! in a box for now. Tried it and converted! i LOVE barefoot running, started a few months back (with a big break for a non-running injury) and just ran my first barefoot 5k race yesterday. My race bling is currently hanging off of the corner of my book shelf. They keep getting moved around. I have never tried barefoot running, in fact I don't know anyone personally who runs barefoot. I like Clif Bar on Facebook. I sent an e-mail out to my friends/family. For hydration I drink water and/or a type of electrolyte drink, especially on long runs. For fuel during a race I've been using GU Chomps, Clif Bars, and fruit. My race bling is currently hanging on the curtains in my bedroom. They totally need to be displayed in all their glory. I've gone a huge chunk of my life barefoot. I'd go barefoot all the time if I could. I've ran in the grass and on some trails/dirt but not on pavement. New Follower of your journey. Added Jason to my bloglist since I can't figure from his website how to follow him but I enjoy reading it and can't wait for the shoe reviews. For Fuel use hammer nutrition products,Gu or Sharkies. Hydration mainly Hammer Nutrition product with occasional Accelerade or Powerade Zero. Medals are displayed on my workout room wall using a thumb tack. I try to finish most speed work, the last recovery mile barefoot, since it helps me keep my form and I can avoid the heel pounding because am tired. 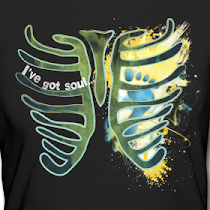 Your giveaway is added to my blog side bar. I normally fuel with some sort of bar... the Luna chocolate raspberry are my favorite. I hydrate with h2o most of the time... i will use powerade after a run if i am feeling ok in the stomach. I dont have enough race bling to worry about how to display it. I have 1 bib sitting on my dresser. I am going to train for a half marathon in the spring and maybe a full in the fall of next year and plan to do something cool like a shadowbox in my office or something. On long runs, I eat ShotBloks. On long runs, I take Nuun with me. Inspired by you to try it. Like it so much better than anything else. Legs are tons less crampy later. My race bling is currently hanging on a light next to my computer. It so wants to be displayed properly! I ran once around the track barefoot. Haven't tried since then, but would like to ... maybe in the spring. What do you do during the winter? Barefoot in the snow? I linked your giveaway on my blog! hydration. I have to admit.... I DID use Nuun for the first time this weekend. Refreshing!! Although, the eppervesance kept on bloating up my bottle and I had to keep letting out the air pressure. ANy tips? I have a wall hanger, but I WILL be hitting up Brad soon for a medal hanger!